Freddie King: Patriarch Of Blues Rock The Texan, whose biting guitar sound influenced artists from Eric Clapton to Jeff Beck, will be inducted into the Rock and Roll Hall of Fame this Saturday. Freddie King performs in 1973. On Saturday, the "Texas Cannonball" finally gets his due. At the Roll and Roll Hall of Fame induction ceremony, attention will most likely focus on the big-name groups being honored, including Red Hot Chili Peppers, The Beastie Boys and The Small Faces. But many of rock's greatest guitarists — including Eric Clapton, Jeff Beck, Carlos Santana and Stevie Ray Vaughan — have acknowledged a large debt to the late blues great Freddie King, who is being inducted to the hall this year for his early influence on rock music. Among the "Three Kings" of electric blues — along with B.B. 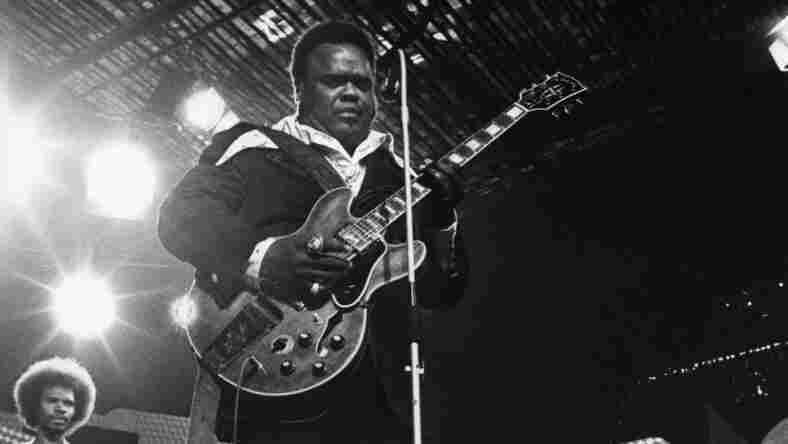 and Albert (no relation) — Freddie King is the last to be inducted into the rock hall. But in some ways, his late induction mirrors his career. Freddie is probably the least well-known of the Kings, but he has arguably had the most influence on rock guitarists. Born and raised in Texas, Freddie King learned guitar basics from his mother and uncle. At first, he soaked up acoustic blues and Texas country, but in late 1949, at the age of 15, he moved to Chicago with his family. It was there that King learned from such electric Chicago blues greats as Jimmie Rodgers and Muddy Waters and eventually came up with his signature sound. King's blues style was fluid, but with biting power that was arguably more forceful than that of many other bluesmen of his day (with the notable exception of living legend Buddy Guy). King used thumb and finger picks and would just dig into his Gibson 355 — hung precariously over just his right shoulder — creating what are now classic, deeply influential and riveting solos. King's versions of blues classics such as "Key to the Highway," "I'm Tore Down" and "Have You Ever Loved a Woman" have become part of the blues-rock pantheon. "We owe a debt of gratitude to Freddie and other original bluesmen for, basically, the songbook they gave us," blues-rock guitarist Joe Bonamassa says. "Freddie was more of a rock guitar player. Freddie always had a dry, immediate sound." While B.B. and Albert King are known for their exquisite, minimalist solos with sinewy bends and telltale vibrato, Freddie King was a little more rock 'n' roll. "I can easily identify his sound and his style," Bonamassa says. "The attack and the intensity — you can tell who he is in three notes, you know?" Fittingly, Bonamassa will help posthumously induct King Saturday with another member of the younger generation of blues-rock virtuoso guitarists: Derek Trucks of The Allman Brothers Band. They'll be joined by Freddie King's fellow Texans Dusty Hill and Billy Gibbons of ZZ Top for a rock hall jam in Freddie's honor. Wanda King, his eldest daughter, will represent the family at the induction. "Freddie King set the standard of a black bluesman doing rock blues," Wanda King says. "Clapton, [John] Mayall, Jeff Beck, Warren Haynes — the list goes on and on. Many of these guys really jump-started their careers off of my father's music. He definitely has a place in the Rock and Roll Hall of Fame." King's classic instrumental "Hide Away" became a gateway tune for many guitar players: You had to show your chops with a version of "Hide Away." Named after a Chicago bar and, King admitted, stolen in part from a Hound Dog Taylor tune, "Hide Away" became King's trademark song in 1961. That year, he had an incredible series of six hits in the R&B Top 30 and three Top 10 hits. Like many musicians and fans, Bonamassa came to Freddie King via the British Invasion guitar greats Clapton, Beck and Jimmy Page, who reignited interest in American blues. He then made his way to King's later recordings on Leon Russell's legendary Shelter label and got hooked on the sound. "My first introduction to 'Hide Away' was on the John Mayall and the Bluesbreakers album with Eric Clapton," Bonamassa says. "Same thing with 'Please Accept My Love' and 'Going Down.' It's part of the playbook, the songbook we all use." King died in 1976 at just 42. Constant touring — immortalized in the Grand Funk Railroad line, 'Up all night with Freddie King / Man I gotta tell you, poker's his thing' — as well as a poor diet (Bloody Marys were reputedly a favorite meal) hammered his health. "He left us way too soon, but his legend will live forever," Wanda King says. "Some people are put here for one thing and then move on." Wanda King says she's heartened by the thought that kids today know you have to go through Freddie if you want to get to blues-rock. She says she gets emails all the time from around the world. "I read one from a 14-year-old from Brazil, and he just got his first Freddie King CD and his first guitar. That's awesome," she says. "Young kids are into Freddie King if they are into the guitar." Maybe the next blues-rock great is practicing those pentatonic blues scales right now in Brazil, or Bratislava, or Baltimore — up all night with Freddie King.